Vitamin A is commonly known as the anti-infective vitamin, because it is required for normal functioning of the immune system. The skin and mucosal cells (cells that line the airways, digestive tract, and urinary tract) function as a barrier and form the body's first line of defense against infection. Retinol and its metabolites are required to maintain the integrity and function of these cells. Vitamin A and retinoic acid (RA) play a central role in the development and differentiation of white blood cells, such as lymphocytes, which play critical roles in the immune response. Activation of T-lymphocytes, the major regulatory cells of the immune system, appears to require all-trans-RA binding of RAR. I'll be heading to Costco tomorrow to pick up some of their delicious organic carrot juice. Any other carrot juice drinkers out there able to corroborate my feelings? *edit* Be sure to read this before SUPPLEMENTING vitamin A. Carrot juice is fine. David, I love carrot juice! I got a juicer earlier in the summer and have been using it frequently, and carrots are one of the things I regularly put in my juicer. My hubby loves it too. One of our favorites is to juice a bunch of carrots, add an apple for sweetness, and maybe a tiny bit of ginger (a little bit is all you need - too much and the juice burns!). It's great and it's always been really easy on my tummy - I figured that was just because the fiber was broken down. Glad to hear it's got so many benefits, I'll definitely keep up with it! Can I ask, you mentioned Costco's carrot juice - is it 100% juice? I have found that store-bought juices, especially if they're less than 100% juice, affect my tummy negatively. Even the 100% juices sometimes don't do good things to me. I only bought the juicer because it was $10 at a garage sale - I wanted to try juicing, but kind of assumed it'd also be hard on my tummy, so I figured $10 was cheap enough to give it a try, and I'm glad I did. Fresh juice is sooo much different from store-bought juice. If you can find a juicer for a good price, I would highly recommend getting one! The Costco juice is indeed 100% juice and quite good. I agree with you on the fresh juice though! I am glad that you posted this. Because of my stomach, I have not been eatin any fruits or veggies. So a friend bought me a juicer. My favorite is carrot juice and I try to drink carrots daily. I thought it was helping, but passed it off to just having some fruits and veggies in my stomach again. I hate carrots and I hate carrot juice. And I mean carrots are literally the only vegetable I refuse to eat. Now that being said....I believe this lends support to your theory because I am most likely in need of carrots or deficient in Vitamin A to some extent which contributes to my flares. Hmmm...what other options might one be able to suggest that are high in Vitamin A? Seriously though, we have a list of some foods high in vitamin A here (scroll down a touch). ...maybe I'm an odd person but when I was a little girl(between ages 5-10) my dad would make up a fresh drink of freshly juiced carrots and we'd sit there and drink our glasses of carrot juice together. My dad would tell me I'm going to have good eye sight because I'm drinking carrot juice. Somehow though I got crohns disease. Of coarse I'm the only one in my family to have crohns disease. IDK the things which are supposed to help me usually don't. And thanks for the list....I might have to find some alternative other than the meat smoothies....I mean the sound of that makes carrot juice sound absolutely delighful. My mother has Sjogrens and she loves carrot juice!!! I juice twice a day. Since I started juicing, I almost forgot I had Crohn's. I don't use a lot of carrots because they are high in sugar but I get plenty of vitamin A in my juices. I cannot believe how great I feel and I know juicing is the reason. I prefer three apples(one which is green to add some sour) and 4 or 5 carrotts. Juice and enjoy. This is my all time favorite, fall back to when else fails, juice recipe. As an addition, if anyone out there is planning to supplement vitamin A after reading this please read this article first. Carrot juice would be fine, but supplemental vitamin A can cause problems. Celery and beetroot are good added to the carrot, apple and ginger. David, I buy the organic carrot juice from Costco too & it's great! Costco's has a good deal on organic carrots. I think its 10lbs for 7bucks, if you have a juicer juice them. Yams are good for vitamin A if you can tolerate them. I have just picked up on this thread. Just had my first Crohn's flare for thirteen years and I am very aware this was an exceptionally good run. It would be impossible for me to know why I was able to go so long (I have not taken medication for ten years) - however - I have, for many years, made fresh carrot juice three or four times a week. Was this a factor - well just maybe. Keep the carrots in the fridge and drink immediately after juicing - no need to add anything else (if you like carrots of course). There really is no downside, it is so good for you on every level. In my opinion just go with 'live' fresh juice rather than cartons. Not allowed carrots, or anything else, until after my liquid (Fresubin) diet but I am sure it will help and that is good enough for me. My first Crohn's attack actually occurred while I was in my 3rd month of juicing fruits and veggies daily. As I didn't know what was happening, because it was a while before I was diagnosed, I began eliminating certain fruits, veggies and other food. I found that I tolerated Carrot Juice very well and used it to regulate me before starting the sulfur meds. I still like it very much and have no problem with it. And thanks for the tips on Vitamins A and D! Advice on vegetable juice can be confusing - I have been told that generally vegetable juice is very good - but not during a period of flares. I suppose that is sensible! Yes, thanks,Rob. I think that the juicing just happened to coincide with the first major flareup, but maybe had not been the real cause of it. Over the past year, I have researched all of the possible stressors and eating habits that might have contributed to the first major flare-up and have still not come up with any one definite factor. I am very geared, though, towards seeing my CD as an auto-immune problem brought on unresolved emotional factors. Hmm, I'm considering trying this. Although I don't have a juicer I wonder how well my magic bullet would work. Think a magic bullet is more for smoothies than juicing . I have just got a lequip juicer and its great and really easy to clean. The jury is still out as of yet how or if it is helping, but I am going to stick with it for the time being. 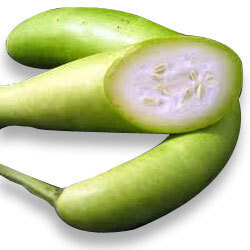 What is bottle gourd? We've just started juicing and we're doing carrot and apple. It seems to be expensive. Lots of carrots and apples for one glass of juice. Am I doing it wrong? 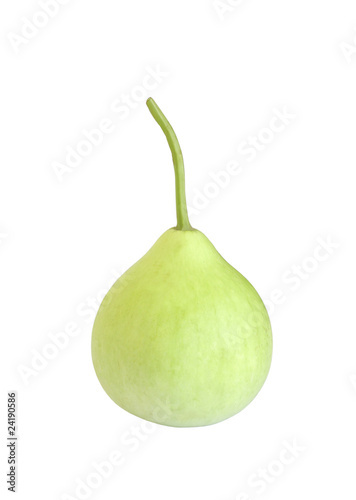 This is bottle gourd..a kind of vegetable. you can find it in the vegetable market. I read a book on juicing years ago (it was included with the juicer I bought) and it was like switching on a light - it all seemed so obvious when explained. I am a great believer in the power of raw vegetable juice - carrot & celery is the big one with me (not as sweet as the version with apples). I've moved on from smoothies and have pulled out a juicer that my mother bought years ago and never used. Tried it for the first time tonight and I'm super thrilled about it. Juice will be a regular in my diet now. We use this list to guide us in buying the cleanest produce. I also love Costco's juices. Its relatively cheap and delicious.